While Erply’s feature set may be overkill for small business owners, this POS system provides the flexibility needed for growing companies, and offers a great deal of value for the price. Following in the footsteps of Skype which also began in Estonia, Kristjan Hiiemaa founded Erply in 2009 with a team of just five employees. His goal was to provide organizations with an inexpensive and easy-to-use software solution that could handle all of their business needs. Erply is more than just a simple POS system and even its name indicates this. The letters ERP in the company’s name stand for Enterprise Resource Planning, and its product provides the HR capabilities, supply chain management, customer relationship management, accounting capabilities and access controls you would expect from ERP software, alongside the ability to take payments. So how does Erply stand up to the competition? Let’s take a closer look at the company’s offering to see if it delivers on Hiiemaa’s promise to do for business software what Skype did for telecommunications. Erply has four pricing tiers: POS without Inventory, Inventory Online and Offline, Inventory and POS and Enterprise. The first plan, POS without Inventory, is for small shops without inventory and costs $49 per month. This plan includes two user accounts, one POS license, basic reports, basic CRM, a POS mobile app, Cayan integrated payments and mobile POS. In terms of support, you will only be able to contact Erply via email. The company’s next plan is ideal for web shops and warehouses that need inventory management capabilities. The Inventory Online and Offline plan costs $89 per month and includes two user accounts, one warehouse license, a real-time inventory backend system, product management, reporting, email purchase orders and mobile inventory. Erply’s most popular plan is likely its Inventory and POS plan that starts at $119 per month. This plan combines inventory management with POS capabilities and includes two user accounts, one POS with inventory license, mobile POS, advanced reporting, advanced customer database and API, gift cards and store credit, a customer-facing display and API access. The top-tier offering is Erply’s Enterprise plan which is ideal for large multi-store enterprises or franchises. However, you’ll have to contact the company directly for a quote. All of Erply’s plans come with a 14-day trial so that you can test them out in the field and see which is the best fit for your business. Unlike other POS systems that lock you into using either iOS or Android to run your business, Erply is hardware agnostic. This means that you can pick and choose from a variety of hardware vendors such as IBM, Toshiba, Star, Epson and Verifone when it comes to payment devices, printers, cash drawers, customer displays, scales and scanners. Erply also makes it easy to access your POS system by allowing you to do so from any web browser. For instance, if one of your systems goes down during a busy period, you can easily use an old laptop or any device with a web browser to access your Erply installation. However, the company does recommend that you use a device with a 1GHz or faster processor, 1GB of RAM, 3GB of hard drive space, and a display with a resolution of at least 1024 x 768. Erply offers quite an extensive list of features, so in the interests of time, we’re just going to highlight a few of the most notable ones. The company’s POS system can process credit cards, cash and check payments, as well as create, redeem and track gift card payments. You can also easily see the register totals from all of your business locations at any time thanks to real-time reporting. Erply even gives you the ability to create custom purchase orders with your business logo and font. The system’s supplier database allows you to keep track of all of your vendors in one place, and this is automatically connected to the purchase order creation system to facilitate quick ordering. With Erply’s inventory management, you can view how much stock you have of an item at each store location, or even at all of your locations, to easily transfer items between stores. You can generate multiple price lists using the inventory module so that pricing can be determined by location. Advanced customer management features in Erply allow you to record and manage detailed customer contact information including name, address, phone number, email, business info, social network details, loyalty card codes and bank information. The company’s POS system is also able to record each customer’s sales history which can help with directing promotions, recommendations, discounts and other specials. Erply also has a number of integrations with popular software including QuickBooks, PrestaShop, Magento, and Shopify, as well as Erply accounting and e-commerce. If you’re running a small business that can’t take full advantage of Erply’s extensive feature set, then here are a few alternatives that might suit your needs better. Square POS provides the necessary software and even hardware to start accepting card payments. The company gives all customers a free Square Reader, but also offers additional hardware to meet the needs of your business. Square’s Virtual Terminal also gives vendors the ability to enter credit card payments from any internet-connected device with a web browser. While the company’s POS solution may not be enough for large operations, it could be a perfect fit for SMBs looking to occasionally accept card payments. 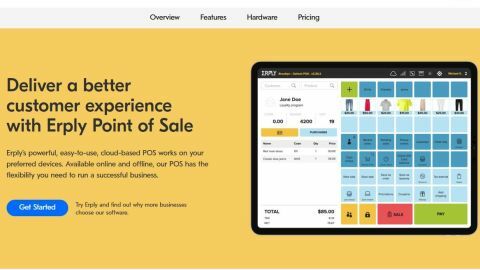 Small businesses with a focus on e-commerce might want to check out Shopify POS as it fully integrates with the company’s e-commerce platform. Businesses can get started for just $29 a month with its Basic Shopify plan which also includes an online store. Erply stands out from the crowd by offering a long list of features on par with its more expensive rivals such as NCR Silver. However, the company’s POS system has a steep learning curve and could be overkill for small businesses. Erply provides businesses with a great deal of power at a competitive price and this makes it well-suited for medium to large retail operations that are growing quickly. The flexibility of being able to use a wide range of hardware is also a nice plus as it helps businesses avoid vendor lock-in.